Time in a Bottle: A History of Owens-Illinois, Inc. It was called the most significant advance in the production of glass in 2000 years. It has been designated as an international historic engineering landmark by the American Society of Mechanical Engineers. In 1913, it received a commendation from the National Child Labor Committee of New York City for reducing the need for child labor. It made possible the modern distribution of many processed foods at greatly reduced costs. It provided a cheap and safe method for storing and transporting prescription medicine. Without it, some of the country's major corporations, like Coca-Cola, might not have been possible. And without it, Toledo would not have been the "Glass Capital of the World." To the layman, the Owens Bottle Machine looks like a many armed monster. The complexity of its engineering boggles the mind. The fact that it was invented by a man who lacked any formal education or technical training makes it even more remarkable. Michael J. Owens, who began working in the glass factories in Wheeling, West Virginia, at the age of 10, learned glass manufacturing the hard way. He shoveled coal into the furnaces, worked as a "carry-in boy" taking fiery hot blown bottles to the annealing lehr, as a "carry-out boy" taking cooled glass out, and as a "mold hold boy" opening and closing molds for the master glass blower. The blower, who gathered a red-hot "gob" of glass from the furnace and onto the end of a blow pipe, made bottles one at a time with the help of at least three boys like Owens. 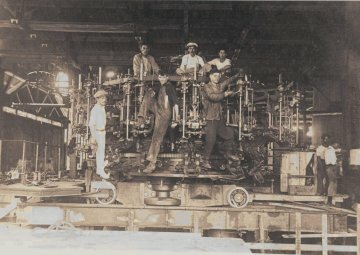 While the automatic bottle machine is incredibly complex, Owens's vision for a machine to do the job of all of these workers was not. As Owens conceived it, a gob of glass was sucked into the top of a bottle mold through a rod that looked similar to a blow pipe, and as the piston reversed with a burst of air, it was pushed down through the rest of the mold. Not only were child laborers no longer needed, but skilled glass blowers were also unnecessary. At the end of the process, the bottle would be delivered to the annealing lehr by a conveyor belt. The first successful commercial model, produced in 1905, could make 9 bottles a minute or nearly 13,000 a day and required two men per shift to operate. This compared to around 3500 produced by hand in 24 hours by seven skilled men and boys. The machine dropped the cost of production from $1.80 a gross to 10 to 12 cents a gross. What started as the vision of a man with little education but much ingenuity has become an international corporation. It has spawned other technological innovationsand major corporations that produce spun glass fibers and flat glass. While Edward Drummond Libbey brought the glass industry to Toledo in 1888, it was Michael J. Owens, hired by Libbey at the age of 29, who made the industry in the city successful. 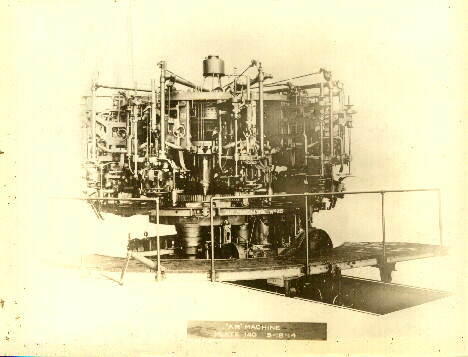 This exhibit showcases Owens's invention, and the development of his company. It details how that company grew and changed, and its influence on the city and the world. I hope visitors will leave with not only a greater appreciation for Owens, but with a better understanding of the importance of the glass industry to our city. While our claim to be the "Glass Capital of the World" may be debatable today, the impact of the industry on our city's past and future is not.